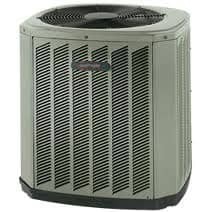 Central air conditioning systems in Westchester and Putnam counties. For a professionally installed air conditioning that’s sized properly to fit your home and needs, call Robison today. To easily circulate cool air throughout your home, you need central air conditioning. Traditional central air conditioning units and systems include an indoor unit – such as a furnace or air handler – and an outdoor unit. The outdoor unit cools the air and sends it to the indoor unit, which then circulates the cooled air throughout your home. At the same time, the indoor unit sends heat from the original indoor air back to the outside unit, which releases that warmer air into the atmosphere. A two-stage air conditioner improves upon this system by operating at a lower output capacity during mild weather and increasing its output during the hottest summer days. Since the low output is used the majority of the year, you save on energy consumption and needless system wear. Your Robison technician will ensure that all ductwork, equipment, parts, and supplies are compatible with your central air conditioning system, because when the air conditioner matches properly with the furnace or air handler, the system will reach maximum efficiency. Because the main unit is located outside your home, you eliminate the intrusive indoor noise levels you experience with free-standing window units. Another advantage is cleaner air: When room air is circulated through the system, it passes through a filter that removes dust, lint, and even microscopic pollutants from the airflow. This cycle is constantly repeated, and is impossible to achieve with standalone units. Finally, central air helps reduce the humidity in your home. Do you need to buy a new air conditioning system, or have your existing equipment installed or repaired? Contact Robison for a FREE estimate. Robison, serving Elmsford, Greenburgh, Mount Pleasant, Mount Vernon, New Rochelle, White Plains, Yonkers and surrounding towns in Westchester and Putnam counties, NY.